TWO PRIMARY SCHOOL teachers and an accountant have been spared jail for taking part in an “ugly” 10-man brawl in popular Dublin pub. 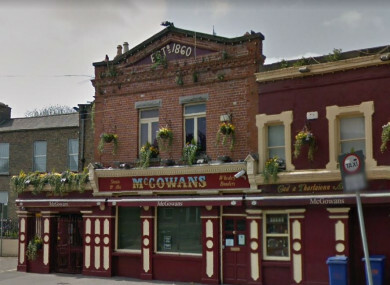 Four of the accused who have Dublin addresses and the fifth, from Co Kildare, had pleaded guilty at Dublin District Court to taking part in violent disorder after a row broke out at McGowans pub in Phibsborough in the early hours of 14 July 2017. Teachers Michael Davitt (34), from Clanmaurice Road, Donnycarney, and Seamus O Cearra (34), from Mount Symon Green, Clonsilla, Dublin, were each ordered to donate €800 to charity. O Cearra was also given a one-month sentence by Judge Brian O’Shea, who suspended it on condition he kept the peace for six months. Sentencing, Judge O’Shea told Davitt and O Cearra that when they went out they were ambassadors for their schools and “in this regard they had let their profession and more importantly themselves down in a most egregious way”. Accountant Conor Shannon (33), from Glendale Estate, Leixlip, Co Kildare, avoided being jailed and was ordered to donate €800 to charity within six months. Judge O’Shea told Shannon and Davitt to appear again in March 2019 and they would get the Probation Act if they complied with the order. Warehouse manager and soccer team captain at Drumcondra Football Club Stephen Cantwell (28), from Collins Avenue, and electrician David McSweeney (31), from McKee Avenue, Finglas, also appeared before the same court in connection with the incident. McSweeney, who was celebrating his birthday on the night of the fight, faced an additional charge for producing a glass as a weapon during a dispute. He had 27 prior convictions and waited for the “perfect moment” before throwing a pint glass “full force” into O Cearra’s face “at short range”, the judge noted. McSweeney was jailed for six months while Cantwell was given a two-month sentence which was suspended on condition he stays out of trouble for the next six months, and he must give €800 to charity. Judge O’Shea described it as an ugly incident in which the pub staff did their best and “struggled and struggled to placate the accused”. None of the five defendants walked away or retreated during the fight, he remarked. Bridewell Station Garda Gerard Loughnane, the investigating officer, had provided the judge with the CCTV footage which was viewed just before the sentence hearing. References from the men’s employers and other testimonials were also handed in to court. In an outline of the facts, the judge heard the incident happened at 2.40am and up 10 people got into a row which continued even after staff tried to separate them. The fight continued for a while but was finished by the time gardaí arrived. Judge O’Shea heard Stephen Cantwell was observed hitting another male from behind – after he had been punched by that man earlier in the row. The court was told that Davitt, who teaches at Holywell Educate Together in Swords in Dublin, was also involved in the melee and had thrown a number of punches “but not at anyone in particular”. He also suffered a bloody nose after receiving a blow to the face, the court heard. McSweeney was also seen fighting and threw a glass which hit O Cearra, who was injured and suffered a cut to his forehead. Judge O’Shea rejected McSweeney’s claim he did not intend to hit O Cearra’s face with the glass but the wall instead. Judge O’Shea, who had studied the video evidence, described that claim as “absolute nonsense”. O Cearra, who works at Mary, Mother of Hope National School in Littlepace, Dublin 15, was also kicked. However, he was also observed punching one man in the face knocking him against the bar and on to the floor. Judge O’Shea commented that this action along with McSweeney’s use of a pint glass escalated the incident. Judge O’Shea heard that Shannon was knocked down during the fight but he was seen throwing punches, “but was not observed assaulting any person in particular”. All five men apologised in court via their lawyers. Stephen O’Mahony, the solicitor representing Cantwell and McSweeney, pleaded for leniency and said his clients had since returned to the pub to say sorry to the staff. O’Mahony said the incident was instigated by people not before the court and that alcohol was a factor. Cantwell previously had a problem with alcohol, the court was told. Solicitor Michael Hanohoe said Davitt, Shannon and O Cearra were “extremely ashamed” but “it was sparked off by actions of others” and they retaliated after Davitt was the first to be attacked. He described it as a ruckus and a rumble that went “topsy turvy”. He also asked the court to note the incident took place in a narrow space and over a short period of time. Shannon had one prior conviction for a minor assault for which he was bound to the peace in 2012. Cantwell had nine convictions for public order, assault and drug possession offences. McSweeney had 27 prior convictions for drink driving public order and road traffic offences, the court was told. His solicitor claimed he had been trying to protect his friend Cantwell. No damage was caused to the pub and just bottles and glasses had to be cleaned up afterwards. None of the staff were injured, the court heard. Another man was previously dealt with by another judge at the same court for being involved in the incident. He had his case struck out after he pleaded guilty and agreed to a €400 court poor box donation. The Director of Public Prosecutions had directed their cases should only be retained by the district court if they pleaded guilty, otherwise, they would have faced trial in the circuit court which has tougher sentencing powers. Email “Teachers avoid jail after 'ugly' brawl at Dublin pub ”. Feedback on “Teachers avoid jail after 'ugly' brawl at Dublin pub ”.